Have you heard the news? Cincinnati is rated one of the top 10 cities in the whole country to see and have we got the tour for you! Whether you have lived here all your life or just visiting, the new streetcar is the way to see it all. We sit and dine at three unique restaurants, enjoying a sample of beer and wine in the backstage entertainment district. We catch the streetcar to the hip and trendy Over the Rhine neighborhood to sample more Cincinnati favorites. We conclude our culinary adventure at Findlay Market, chock full of interesting food vendors and more eateries to try. There is so much to see and taste on this tour, we promise to leave you full - both mind and body! Plus you have an all day streetcar ticket to continue the fun on into the night. 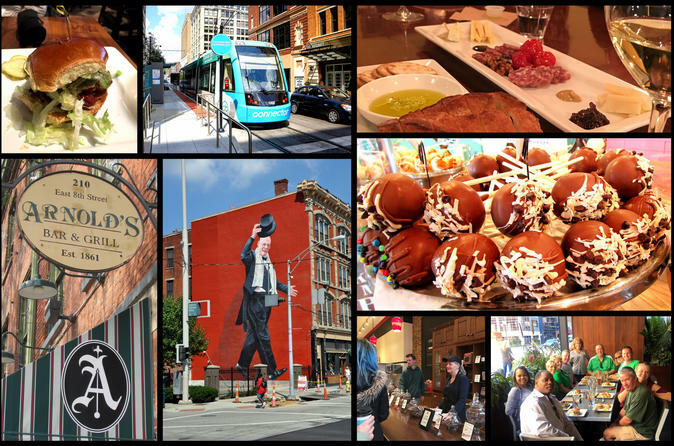 On our 3 hour Cincinnati Streetcar Food Tour, we work in conjunction with some of the best restaurants in the city. We have a huge selection to choose from, so the restaurants will vary from tour to tour. Depending on their availability, we visit We Olive for an informative tasting of olive oils and vinegar, plus a sample of wine and an array of charcuterie board tastings. At Nicholson's Pub we enjoy an authentic Scottish dish or at Bru Burger, a gourmet burger and inside the Contemporary Arts Center at Melt Eclectic Cafe, a new bistro, we enjoy fresh innovative salads and sandwiches. We’ll board the streetcar and travel a few blocks north, where we may visit Arnold’s, a quaint and quirky bar/restaurant operating continuously since 1861 or continue riding north to Over the Rhine. In OTR, tastings are on the sweet side featuring 3 Sweet Girl’s Cakery, Quaintrelle, Holtman's Donuts or Brown Bear Bakery. Each spot is better than the next! We head north to Findlay Market, where stops may include Maverick Chocolate, where we sample piece after piece of hand crafted chocolate made right in the store. Another new addition is Harvest Pizza featuring a new twist on traditional pizza toppings or The Rhined, an artisan cheese and wine shop. We venture inside Findlay Market, where we may stop at Taste of Belgium to savor the taste of a true Belgian waffle and a quick look around. We end our tour in the Findlay Market area with a visit to the Epicurean Mercantile Company where we tour the newest urban market in the city and enjoy a unique tasting from the The Counter located within EMC. Our tours are more than just food. You get an insider's view of the city as we visit some of the newest areas in town as well as famous landmarks. We share the history, hottest spots and all the information you need to know to navigate downtown Cincinnati. We begin out tour in the new Banks neighborhood surrounded by various sports stadiums, Smale Park and restaurants amidst upscale urban living. We hop on the streetcar to the “Backstage Entertainment District" named in honor of the Aronoff Center and learn about the redevelopment of the theater district. We’ll pass by famous landmarks and end up in OTR (Over the Rhine) where we’ll talk about the history and redevelopment of this hippest new neighborhood. We end the tour at historic Findlay Market where there is a bounty of sights and aromas to entice your taste buds.